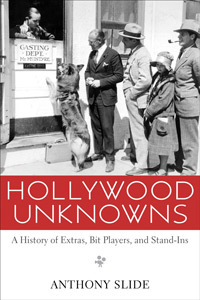 I find it hard to believe, and also totally plausible, that this is the first comprehensive book about Hollywood extras, bit players and stand-ins. After all, we aren't meant to really look at these people. The whole idea is that they are background for the stars and supporting players. And yet, I can think of several times that one of those faces in the crowd has caught my eye, or that I've wondered what it was like to be in a huge crowd scene like in D.W. Griffith's Intolerance (1916), or how it felt to be an extra in a disaster flick with dangerous conditions like The Hurricane (1937). Hollywood Unknowns introduces you to these people. There are so many different reasons the thousands of people who have signed up with Central Casting over the years pursued extra work. Some had lost fortunes, others never had them. Many hoped that they would become stars, thought that would rarely happen. Some had already been Hollywood royalty and were reluctant to leave the movies, even if their audiences had abandoned them. Whole families would make a meager living in extra and bit parts. Injured World War I vets would return to battle again for the cameras. In the early days, there were even a few extras who had fought in the Civil War. And then there were the bored heiresses, retirees and housewives simply looking for a little action, and maybe the chance to meet a movie star. Slide is thorough in his examination of these unsung, but crucial players. He explores their world from the early days of film, where some could scrape out a living as an extra, to the present day where many people do the same work for free. Some of the stories are heartbreaking, like that of the elderly widower who would go nightly to the last movie in which his wife was an extra, desperate to get a glimpse of her because he didn't have a photo of his lost love. Or the husband who would always sneak to the fence when the extras were eating their standard box lunch so that he could slip food to his underfed wife on the other side. There was also the risk of bodily harm on film sets. It is rumored that at least one extra lost his or her life during the filming of a flood scene for Noah's Ark (1928). It is certain that there were many injuries, though the studio did its best to keep the incident on the down low. Women also found the extra business treacherous, and there have been many reports of sexual abuse. Though studios and organizations in the community would often work to keep things moral, and even Wallace Beery saved a few girls from the wolves at a studio convention party, there were plenty of victims. The most common advice for these young, vulnerable women: go home to your family. 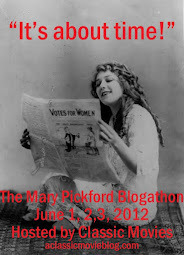 However, despite hearing it from every studio, social service agency and even Mary Pickford, many stayed, determined to be a star despite pitiful odds. To offset bleak tales like these, Slide goes into great detail about the fascinating, precise business of supporting the stars. It was a lot more complicated than I realized. Extras didn't come in one type, there was a hierarchy. An extra who just showed up in street clothes would get the lowest rate. Those who had the means to maintain a fancier wardrobe could make nearly twice as much as dress extras. Certain skills and traits could also make a difference; there was more money for those who could ride horses or dance in a chorus line, and a having hunchback or being of short stature could also pay off. All of this was organized by a studio network that could go into action within minutes, burning up the phone lines to cast a crowd within an afternoon. The stand-ins, doubles and bit players were all just a bit higher than extras. They'd get closer to the stars, though they were warned not to get too close, and sometimes they'd even get a line or two. Willingness to do a stunt could also increase pay exponentially. I was fascinated by many of the facets of extra life described here, but the thing that most moved me about the book was learning the names of some of these dedicated, but unsung performers. I never thought I would care so much about who was Clark Gable's stand-in, or that I'd be so interested in the stories of specific extras who managed to distinguish themselves in a field specifically not meant to do so, but it was touching to learn more about these people, at least to read their names, and to somehow make a deeper connection with them. In fact, after learning about so many individual extras in Hollywood Unknowns, I wondered for a moment if I'd ever look at a group of them again and see an impersonal crowd. I know that won't happen though. Maybe I'll pick out a few faces and wonder about their lives, but once the story gets into gear, I'll forget them again and they'll fade into the background, as they should. But that doesn't mean we shouldn't appreciate them, and now I always will. Deepest thanks to University Press of Mississippi for providing a copy of the book for review. This sounds fantastic! I can especially relate to the topic as my daughter spend several months working as an extra through Central Casting right after she graduated from college. It was a great way to make a little money while she was pursuing a full-time job. (She was also often fed on set for free, LOL.) She had some interesting stories to tell, particularly about the people who treated extras really well; her highest marks went to the cast and crew of NCIS, with CSI: NY getting honorable mention. I know I am now much, much more aware of the people in the background, whether in newer shows or classic films. I tend to watch their faces, wonder who they are, what instructions they had from the director, etc. This book sounds terrific, especially as the author and publisher have good reputations. Thanks for a very interesting review! This must be a fantastic book. Brazilian TCM showed, about three years ago, a vignete about a bit player in the fire scene from Quo Vadis who went to the movies every day, spending all he got from working in the film, just to tell people he was in the movie. In one of these sessions he met the girl who became his wife. <3 Oh, in the scene he passes right in front of Robert Taylor, even touches him to get Bob out of the way, and looks towards the camera! I can always recognize him! Laura--Yes, food was definitely a huge perk for the extras in the book! The sad part about it was that it was the only decent meal of the day for many of them. I loved hearing about your daughter's extra experiences. I hadn't thought about that as a gap filler between jobs, but that's perfect. You can't go wrong with Slide; he knows his stuff and he's a great researcher. Lê--Great story about the Quo Vadis extra! Isn't it funny when you get distracted by an extra like that? Even not knowing their background stories, sometimes one will just grab my attention. It is a fabulous book; a great tribute.